September: It's the traditional back to school month, not just for kids but also for Otto the dog. Author and illustrator Todd Parr joins us today to talk about the e-book success of Otto Goes To School. On September 1st it hit the number 3 spot in the Kids section of the Barnes & Noble Nook store, and the following week it arose to number 2. He generously answered almost every question I sent him. Enjoy! Todd, tell us what your book is about. After a breakfast of juice, cereal, and a banana split, Otto goes to school for the first time, where he makes new friends and learns how to wag his tail without knocking things over. What was your path to publication: Traditional or independent? How long ago? Traditional. 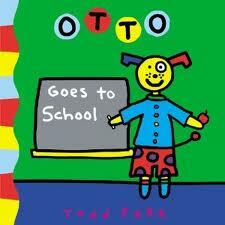 OTTO GOES TO SCHOOL was part of an original 5 book series launched in 2003. Redesign, redesigned icon, colors and a simple read. Repeat buyer of my other books. Facebook, Twitter and my web site. 3-6 year olds. Very well as long as it's on a color device. I was very excited, not to replace the actual book, but to give more options on how people get their content. As you got into e-publishing, has anything happened that you wouldn’t have predicted? That I don't like my recorded voice in reading the books. It is being re-released in print format as part of the Early Reader Program. The book has been reformatted a bit for that. No. I think there is room for both. Two different experiences. I see it as much more interactive. Not sure? In my case, I believe it has helped me. Interactive books that engage kids to read and make it fun. Learn more about Todd and his books by using the links I included above. Check back on Wednesday for a visit with Helen Ketteman, the author of Goodnight, Little Monster, an Amazon Kindle bestseller. And don't forget to have a look at today's updated Kids' EBook Bestseller List for more Top Ten e-books.